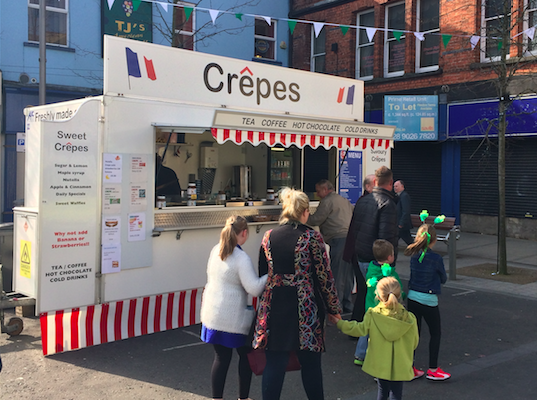 This Belfast-based mobile catering company has been serving crepes from their trailer since 2008. Husband and wife team Alan and Elaine Morrison started out in business because of Elaine’s love of cooking. At first they had a small trailer and have since expanded to a large trailer and small catering cart. That obviously means those crepes are good. They are made to an authentic recipe from Brittany, France. They contain buckwheat flour which adds a lovely nutty flavour. Local suppliers include Dale Farm, Neills Flour and Tom and Ollie. Fillings include Sugar and Lemon, Nutella, Apple Delight, Banoffee, Baby Marshmallows and Nutella, Fresh Strawberries and Nutella, Banana and Nutella, Baileys Banana and Cream, Maple and Bacon, Cheese and Pineapple, Cheese and Ham, Tuna Red Onion and Cheese, Egg Tomato Ham and Cheese, a Vegetarian with Spinach, Cheese Tomato and Mixed Peppers and even a Pizza Crepe with Passata, Cheese, Pepperoni and Oregano. They are prepared fresh in front of the customer in minutes. Apart from their weekly stall at St George’s Market, Belfast and selected events, they are available for birthdays, weddings, private hire and corporate entertainment. St George’s Market, Belfast every Saturday. Check Twitter for other locations. Available for private hire.